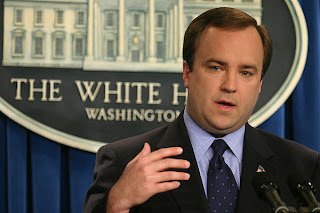 Former White House Press Secretary Scott McLellan caused quite a ruckus Tuesday with the startling (but certainly not surprising) revelation that his former bosses instructed him to outright lie to the American public over the Valerie Plame CIA leak case. "I stood at the White House briefing room podium in front of the glare of the klieg lights for the better part of two weeks and publicly exonerated two of the senior-most aides in the White House: Karl Rove and Scooter Libby," McClellan wrote. "There was one problem. It was not true. I had unknowingly passed along false information. And five of the highest ranking officials in the administration were involved in my doing so: Rove, Libby, the vice president, the president's chief of staff and the president himself." At the time, the chief of staff was Andy Card. Let's take a minute for some quick background: The Busheviks lied about Iraq's alleged WMD arsenal in the run-up to the invasion. They also claimed that Niger was selling Yellowcake uranium to Saddam Hussein. They sent Ambassador Joe Wilson to Africa in '02 to investigate. He came back and reported that he found nothing to substantiate this claim. Despite this finding, Bush re-stated the claim in his January '03 State of the Union Address to bolster his case for war. Angered by this blatant lie, Wilson wrote an op-ed piece in July '03 titled "What I Didn't Find in Africa." This pissed off the Bushies, and in a criminal act of retaliation they revealed the identity of Wilson's wife, Valerie Plame, who at the time was a covert CIA operative. And then they told former Cheney chief of staff Scooter Libby to lie about it all during special prosecutor Patrick Fitzgerald's CIA leak investigation. And then, as payback for his cover up, Bush commuted Libby's sentence after he was convicted of obstruction of justice, perjury and lying to investigators. And now it's being revealed by McClellan that he was instructed by his bosses--including the president and vice president--to stand before the media and voters and lie about it all as further protection against the erupting scandal. Wow. Bush and Cheney shouldn't just be impeached...they should go to jail. Which is exactly where you or I'd be if we manufactured WMD evidence, outed a covert CIA agent as revenge against her whistle-blowing husband, and then obstructed justice with more lies and a criminal cover up. But where the hell is the NY Times on this story? Nowhere. Incredibly, not one solitary word in Wednesday's newspaper. This is a huge bombshell with monumental ramifications--criminal behavior on the part of Bush, Cheney, Rove, Libby, Card-- which could and should finally take down this corrupt, disgraceful administration. Could be the biggest political scandal since Watergate. And how is it covered by the Times? It's not. I'm starting to think this once relevant newspaper must be secretly owned by Rupert Murdoch. Where is the firebrand journalism that the venerable Washington Post demonstrated back in the 70's in serving to take down the corrupt Nixon administration? How is it possible that a story this important goes unreported in the NY Times? It's a sad commentary on the mainstream media overall. They've given this corrupt, criminal administration a virtual pass since it stepped inside the White House in 2000. It's allowed the Busheviks to lie, cheat, deceive, steal and bully with impunity. All you need to do is watch a Bush press conference in the White House press room to see just how neutered the press is. Bush is nasty, condescending, unrevealing, taunting and cavalier as he side-steps the issues and offers inane muck instead. And the press allows it. You can see the fear in their eyes, hoping that Bush doesn't publicly ridicule them, as he has done so often when he hears a tough question he doesn't particularly like. The media ought to be ashamed of itself. And now the Times seems to have joined this pathetic group. Adrienne's film "Waitress" opened in theatres May 2nd to rave reviews from the NY Times, LA Times, USA Today, Wall Street Journal, Newsweek, Time, People, Entertainment Weekly, Ebert & Roeper ("Two Thumbs Up"), Leonard Maltin and others, and has so far grossed $19-million domestically and almost $1-million internationally. The DVD will be released November 27. It's a truly wonderful film that you're sure to love. A link to the trailer is below. Enjoy. Many of my readers have written to me wondering why I've been writing so infrequently these days. It's simple. I've been crazy busy putting together the Adrienne Shelly Foundation's inaugural fundraising gala and Ebay auction, both of which are tomorrow night (Monday Nov 12). The gala is in NYC, and will feature music by Alanis Morissette, and a reading of Adrienne's script THE MORGAN STORIES, featuring Edie Falco, Matt Dillon, Mary-Louise Parker, Ally Sheedy, Gina Gershon, Jason Patric and others. The auction runs through next Sunday. I've also been busy producing SERIOUS MOONLIGHT, a script Adrienne wrote after WAITRESS, which is directed by Cheryl Hines and shoots in LA in 3 weeks. We will soon be announcing an amazing cast. As for politics, my Republican pals will be pleased to know that in just another week or two I will be able to get back to much more frequent writing. I know how much you guys miss me when I'm gone. And to my terrific Lib loyalists, who've always stood by me patiently during this past year of tragedy, thanks for the support...and see ya soon. ......TICKETS ARE NOW ON SALE for the November 12 inaugural Adrienne Shelly Foundation Fundraising Gala at New York University's Skirball Center for the Performing Arts. To learn more about our mission, to make a tax-deductible donation, and to purchase tickets, please visit our website. Every contribution helps preserve Adrienne's legacy, allows us to help others, and creates something positive out of this tragedy. Our very exciting Ebay Auction includes about 25 celebrity items and experiences like walk-ons and set visits to your favorite TV shows (Jon Stewart, Ellen, Rachel Ray), lunch with various celebs (Edie Falco, Paul Rudd, Cheryl Hines, Rosanna Arquette, etc), celeb-autographed items, Sundance Film Fest VIP passes, and concert tickets with meet & greet (Maroon 5). Click here for more items and auction details.